I would like to receive occasional information and updates from Purple Tie and Tiara Ball 2018 and jumblebee. The Mayor of Shrewsbury, Jane Mackenzie, is delighted to be holding a charity ball to raise money for local people recovering from alcohol and other substance addiction. She will be using the money raised to set up a charitable trust, which will support those in recovery, their families and friends. Jane is working with Shropshire Recovery Partnership (SRP) to improve services for local people and enable them to turn their lives around. This auction is open for you to bid online until 12 noon on Friday 9th March, when online bidding will close. Bidding will re-open at the Ball on Saturday 10th March, and will only be available at the venue. If you are unable to attend the Ball, but wish to bid on an item, you can still give yourself the best chance of winning by placing a proxy (maximum) bid on this page. We then will carry your bid over to the live auction and continue bidding up for you up to your maximum. You will be contacted after the Ball if your bid has been successful. 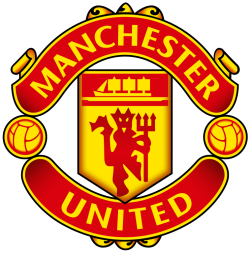 Manchester United football, signed by 17/18 team. Minimum bid is £110 (Bid increments are £5). With a certificate of authenticity, this ball is signed by all the team. 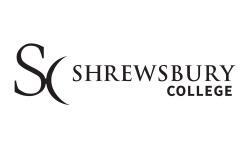 1st Year Fashion and Textile students from Shrewsbury College will be designing a dress for their final project the theme will be "Oriental Journey". You will be able to choose one of 13 wonderful unique designs that the students have carefully produced for their final project of the year. Which then will be constructed for you by Kerry Vamplew. Your chosen design will be turned in a wearable garment that is tailored to you. The prize consists of a unique dress design, an hours consultation with Kerry, followed by 2 fittings and final garment. Two front row tickets to Dan's concert at Theatre Severn on April 11th with an invitation into the Hayden Smith hospitality suite for drinks and canapés during the evening. You will also be invited backstage for a unique chance to meet Dan and the team before the performance. In addition, Dan will present you with a signed CD of his music. Love2Stay really has it all. The fully serviced resort is set in 22 acres of stunning landscape, with the Shropshire hills within easy reach and the Welsh border in striking distance. Love2Stay was created to make it easier to do something special with your down time, so we’ve made sure that there’s as much to do in the surrounding area as there is onsite. Subject to availability this break may be taken in 2018 excluding the months July and August and also excluding school holidays and bank holiday weekends. World famous illustrator Charlie Adlard has personally donated this exciting lot which includes 24 issues of The Walking Dead, bound in hardback, Charlie has also signed and drawn an original artwork in the front cover. He is the UK Comics Laureate 2017-2019. "THE POWER OF COMICS TO ENCOURAGE LEARNING AND DEVELOP LITERACY SHOULDN’T BE UNDERESTIMATED. COMICS CAN CONNECT WITH PEOPLE WHO MAY NEVER PICK UP A NORMAL BOOK AND REALLY HELP ENCOURAGE A LOVE OF READING. I SEE THIS AS A GREAT OPPORTUNITY TO BRING THE WONDER OF COMICS TO A WIDER AUDIENCE." Charlie has been a "veteran" of the comic industry for over 20 years. He's spent the majority of his time since 2004 working on The Walking Dead for which he has received many industry awards. In his time as a cartoonist he has worked on many other projects as far reaching as Mars Attacks, the X-Files, Judge Dredd, Savage, Batman, X-Men, Superman etc and creator-owned projects closer to his heart like Astronauts In Trouble, Codeflesh, Rock Bottom, and White Death. He currently draws The Walking Dead and was Eisner nominated as best artist for it in 2006 . Bodytech Shrewsbury helps thousands of members work towards their fitness goals and it is this experience that makes us truly believe that there is no better place to exercise in Shrewsbury. Minimum bid is £27 (Bid increments are £2). 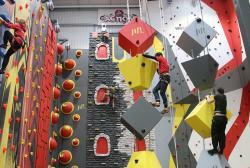 Two tickets for one hours supervised session on the Action Walls at Climbing The Walls, Shrewsbury. Also includes equipment hire and a hot beverage. Action Walls Shrewsbury is the ultimate climbing experience for all ages. A range of fun challenges for all abilities. Afternoon tea with the Mayor in the Castle for 4. 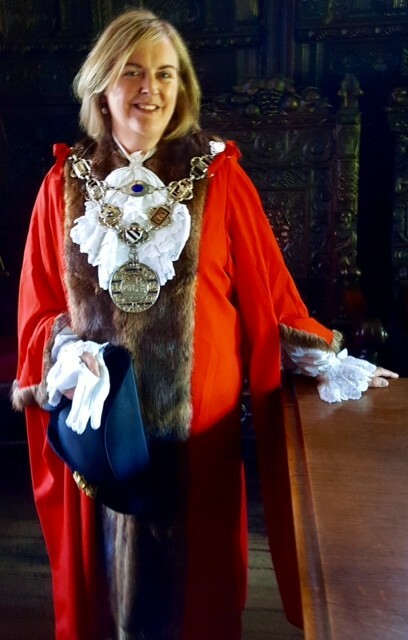 A unique invitation for up to four people to enjoy a cup of tea, sandwiches and selection of homemade cake with Madam Mayor in Shrewsbury Castle. The Mayor has a wonderful circular Mayor's Parlour in one of the turrets of this historic castle. Discover the secret door into our military museum, and enjoy a walk around the grounds. Please note, this prize needs to be taken by May 12th as the Mayor leaves office on May 22nd. 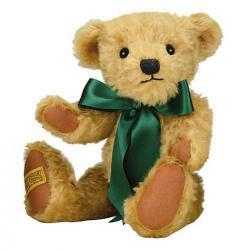 Merrythought is renowned for making some of the world’s finest teddy bears. Handcrafted at the World Heritage Site of Ironbridge, in Shropshire, this fourth generation family run business is now Britain’s only surviving teddy bear manufacturer. Since 1930, Merrythought has been delighting both adults and children with their wonderfully witty and quintessentially English designs. Each adorable bear makes a characterful companion to be treasured and cherished for life. 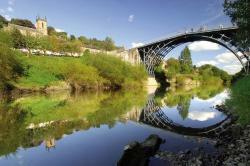 Two admission tickets to all Ironbridge Gorge Museum Sites. Minimum bid is £9 (Bid increments are £2). 2018 Admission for two adults and two children to Rays Farm, Bridgnorth. Bring the family and enjoy ,eating all the animals and birds. make a den in Fairytale Forrest and join in seasonal events. Minimum bid is £34 (Bid increments are £2). 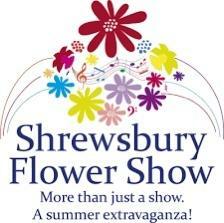 Shrewsbury Flower Show features, T.V. personalities, celebrity Chefs, singers and spectacular arena acts entertain the crowds for 12 hours on each day of the show, ending with a magnificent firework display. The show is one of the country’s Premier Flower Show events, attracting top exhibitors from all over the country. It has a small permanent staff and over 100 volunteers who manage and organise the whole event, from traffic flow, marquee and services contracts, publicity and marketing, public safety, catering , entertainment, engaging specialist judges for hundreds of competitive classes etc. and ensuring that our visitors have an extraordinary experience with value for money. Minimum bid is £1400 (Bid increments are £25). This amazing opportunity to attend centre court and watch the worlds finest tennis players is kindly donated by the Shrewsbury Club. 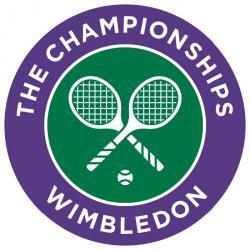 We do not yet know which day at Wimbledon these tickets can be used for, but it will be sometime during the second week. The Shrewsbury club are an award-winning, friendly health and fitness club in Shrewsbury. The best benefits remain the same – members enjoy our warmth of welcome and personalised service. We know your name, we value you. We are the club that feels like home. Our vision is to make a difference to the quality of people’s lives. 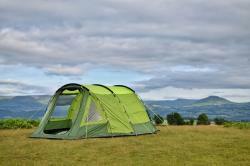 The prize is an Abberley 3 Berth Tent worth £109. The Abberley by OLPRO is a spacious two-berth tent perfect for a couples camping trip. 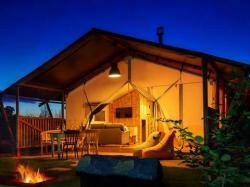 It has a large porch area for storage and separate bedroom inner tent. The short pole sections enable the Abberley to become very compact and lightweight when packed away making it an ideal tent to put on the back of a Motorcycle or bike. The waterproof 190T OLTech Polyester with 5,000mm H/H and sewn in groundsheet will keep you warm and dry in all weather. OLPRO Hush sleeping bag is the ideal 3 season sleeping bags for indoor or outdoor use. The Hollow Fibre filling will ensure you are kept toasty on those chilly nights. Comes with drawstring storage bags. 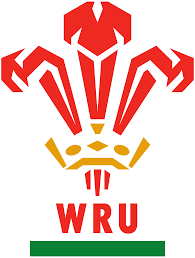 Come and explore the magnificent facets and features that make the Principality Stadium one of the most impressive icons of modern Wales. Join one of our experienced tour guides and visit the Press Conference Suite where the worlds of rugby and journalism meet. Experience the build up before the match in the Dragon's Lair, Wales' team dressing room. Hear the roar of 74,500 fans as you walk down the players' tunnel towards the hallowed turf. Learn about the semi artificial Desso pitch system and fully retractable roof, which allows the entire playing surface to be covered to create one of the world's largest indoor arenas. Take in the view of the pitch from a VIP hospitality suite, and finally lift the trophy to the skies like a sporting superstar in the President's Box, an area normally reserved for royalty. 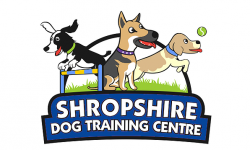 You will enjoy an individual 60 minute consultation with Laura Vaughan-Evans the owner of Shropshire Dog Training Centre. Laura took over Shropshire Dog Training Centre (formally School for Paws) in July 2015. Laura became a professional dog trainer in 2009 after completing a course at Harper Adams University. Since then Laura's knowledge of canine behaviour and training has developed through taking numerous courses, reading the latest research papers and attending workshops and seminars. 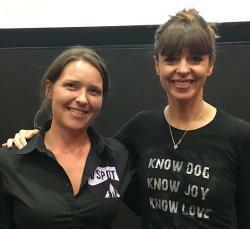 More recently Laura became a Victoria Stilwell Positively Dog Trainer (VSPDT) and has helped out at Crufts and other prestigious events. Over the years Laura has developed a deep understanding of dog behaviour from observing/interacting with her own dogs, as well as working with client’s dogs. Laura is a fantastic trainer with lovely people skills, making all her clients feel at ease. As well as running her own business, Laura has two young children and two border collies. Six week dog training course of your choice. Join one of Laura's highly sought after dog training courses. These include puppy, gun dog , rally obedience, and agility classes. Minimum bid is £420 (Bid increments are £20). Genuine Manchester United football shirt, signed by David Beckham . 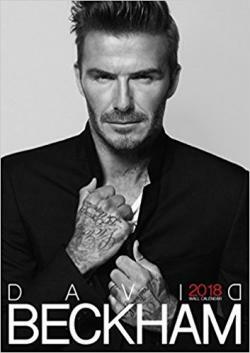 In an amazing and extremely rare act of support, the David Beckham shirt will be personalised to whoever buys it and framed by his management. This shirt will be signed by DB in anyway the buyer wants, within the bounds of decency!, and then signed by him. It is totally unique, it will be framed and could never be bought any way other than through this. 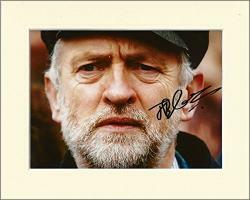 he hardly ever does personalised memorabilia. A wonderful night on the town! Two tickets to a Saturday evening performance of Spamalot the musical at Theatre Severn, Shrewsbury, plus a £20 voucher for a meal at the award winning Third Place Indian Restuarant, just a three minutes walk from the theatre. Lovingly ripped off from the hugely successful 1975 film Monty Python and the Holy Grail, SPAMALOT is a riotous comedy full of misfit knights, killer rabbits, dancing nuns and ferocious Frenchmen. Join King Arthur as he travels with his hapless Knights of the Round Table on a divine mission to locate the illusive Holy Grail – with uproarious consequences. Winner of the 2005 Tony Award for Best New Musical the hilarious SPAMALOT was written by Python legend Eric Idle, with a fantastic score co-written by John DuPrez including Always Look on the Bright Side of Life. Produced by the award winning Selladoor Productions - producers of Footloose, American Idiot, Avenue Q and Little Shop of Horrors, this brand new even SPAMMIER UK tour of Spamalot will have audiences rolling in the aisles. Fantastic opportunity to experience a private Cordon Bleu cookery masterclass with the super talented chef and owner of Beorn Restuarant. 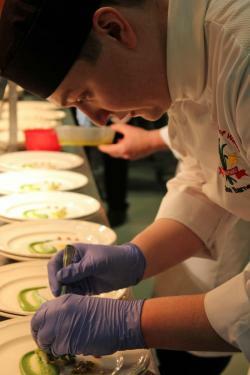 You will spend an afternoon with Joe , learning the skills to prepare a 3 course meal. You will have options to choose your choice of what to prepare on the day. Afterwards you'll be invited to sit down and enjoy your meal. It will be held at Beorn Restuarant, Frankwell Key, Shrewsbury. Joe Barnes, chef and owner of Beorn Restuarant. Minimum bid is £190 (Bid increments are £10). Collection from your home address in the stunning new Jaguar XJ and chauffeured to Peckforton Castle, upon arrival take on the superb Landrover 4x4 course and then enjoy dinner bed and breakfast and return journey to home the following day. Flexibility needed on dates, must live within 40 miles of Shrewsbury and driver must be over 25 with no more than 6 points. Minimum bid is £24 (Bid increments are £2). Battlefield Printing Group have been supplying outstanding quality lithographic and digital printing since 1989. We understand your printed material – it will be one of the first impressions your clients see of your business. From your brochures, newsletters, leaflets, stationery, posters, wide format graphics or just about anything that involves ink on to paper and board, We can help you, we speak plain English (minimal technical talk) giving you a stress free service. 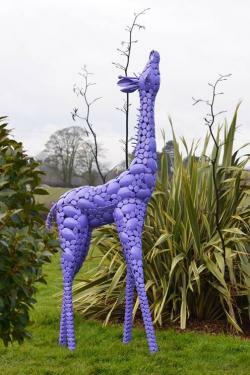 This charismatic giraffe sculpture has been uniquely created for Jane's Mayoral charity ball. There is only one in existence, - it's a true one off! It has the whole package, stunning style and boundless charm. Created by hand from both sheet and pebbled steel, the purple giraffe has been given a lacquer coating to enhance his natural finish. Impossible to put a value on this giraffe - its priceless! The giraffe's friendly features make him a hit with family and friends of all ages. A garden decoration like no other, this sculpture is a spectacular statement for both domestic and commercial grounds. 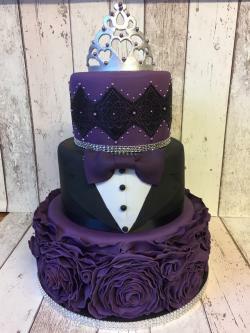 Amazing three tier purple tie and tiara cake. Our amazing local cakemaker, Mandy, is creating a 3 tier celebration cake especially for the Ball! 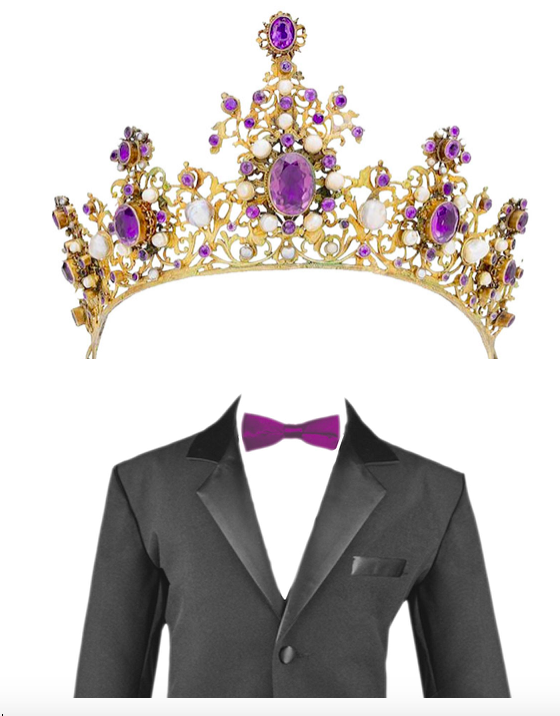 She is planning to include the purple tie and Tiara theme in her design. Mandy at Amanda J's bespoke cakes, Shrewsbury. Home Farm is situated on the Attingham Hall estate, just off the B4380 in Atcham, near Shrewsbury. The entrance to the farm is signposted off the main road. Russell Brand's new book, signed for Shrewsbury. 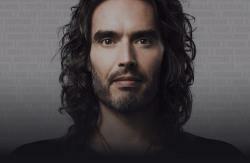 New Copy of Russell Brand's book on Recovery, signed and personalised to Shrewsbury. Jeremy signed this bottle for us this week. He doesn't usually like to have his name associated with champagne, so this is EXTREMELY rare! Snap it up as a real piece of political history!! Wow! 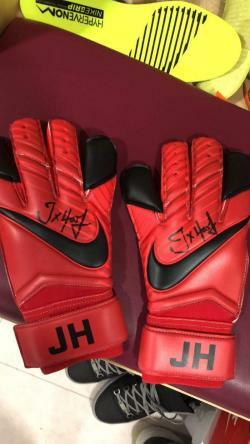 Joe has kindly donated these beautiful initialled red England goalie gloves, and has signed each one. 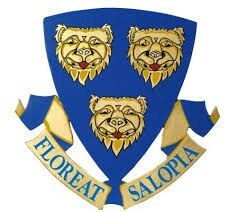 He is Shrewsbury born and bred, and is supporting our Mayor in her charity work. Thank you Joe! 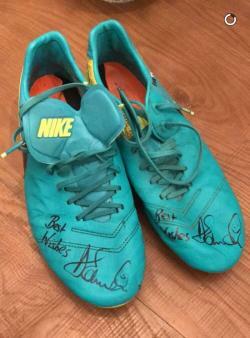 Dave Edwards ( Wales ) football boots. He wore these, playing for Wales, at the UEFA European Championship, 2016. This was in France, when Wales reached the semi-finals! 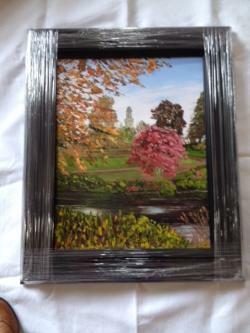 Beautiful original oil painting on board of Shrewsbury's iconic Quarry park. On sale in town for £275. It would make a wonderful Mother's Day gift!